I finally got my hands on John Ronald Reuel Tolkien's Children of Húrin from the library and read it without further delay. A big fan of The Lord of the Rings and The Hobbit books which I read years before Peter Jackson's LOTR movie trilogy came out, I was clearly awed by the stories of Middle Earth and Men and Elves... So much so that I even read The Silmarillion, which was quite complex for me, honestly, to get a complete picture of this fascinating world. 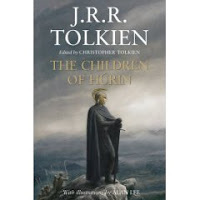 Put together by his son and literary executor Christopher Tolkien, Children of Húrin is a collection of early writings which were abandoned/unfinished by JRR Tolkien. The story is set about 6000 years before the Lord of the Rings saga unfolds. Sauron is just an evil henchman of Morgoth, the original Dark Lord. And Hobbits don't exist yet. Pieces of this book has been published before, but, this book attempts to collect it into a continuous narrative. Christopher Tolkien explains that he did not "invent" anything for this publication and simply collected his father's works as-is, making editorial decisions as needed, keeping it to a minimum, and trying not to bridge any gaps or explain any inconsistencies. Instead, he provides genealogies, pronunciation guide, simple maps, and information on background and history of the Middle Earth, plus an index of names at the end of the book, which I always find interesting. Noted artist Alan Lee provides color plates and line drawings. Inspired by the Norse tale of Sigurd and Fafnir, Tolkien first wrote a story about a dragon in 1899, at the age of 7. At school he discovered the Kalevala, a Finnish epic poem, and by 1914 was trying to turn the tale of Kullervo into "a short story somewhat on the lines of Morris’s romances". By 1919 he had combined these elements in what became the tale of Túrin Turambar, the embittered hero who slays the dragon Glaurung, but whose triumph is instantly shattered by the suicide of his wife, now revealed as his lost sister Niënor, whom he joins in death. Children of Húrin, the book, was not very satisfying for me, as expected. I wanted more! But, the tale is so tragic and filled with impetuous and imprudent acts by the characters which defy reason that it made me wonder if they didn't deserve the fate they got. Túrin, rash and reckless, not given to heeding counsel, turns an outlaw out of pride rather than graciously accepting the good that people offer his way... And, so is Morwen, his mother and Niënor, his sister, who, though not built to handle the treacherous quest they embark on, defy counsel and flee safety in search of Túrin. But, it was all due to Morgoth's curse. Not that that makes it better, but, at least, it gives a dimension to Morgoth's depravity. However, whereas I reveled in the serendipitous adventures of Frodo, I could not suffer the darkness that engulfs Túrin, the son of Húrin, in this tale. The precise and formal style of Children of Húrin had me re-reading some passages to make sure I got it right. That just shows my unfamiliarity with Anglo-Saxon verse form (aka "ancient English alliterative metre", as I later found out) and Tolkien's special gift. sheela, I read hurin and came out very disappointed..
one query - would u have read this book and enjoyed it if it had been penned by some one else other than tolkien. my guess it would have been a big disaster in sales..
satish, you hit the one point i could not bring myself to pen down clearly enough when i wrote this post: had it not been Tolkien's, and had it not promised to elaborate a bit on the early days, and had i not been a LOTR and Middle Earth fan, after a casual read of a few pages i would not have bothered to finish the book. you are right, it would have been a disaster in sales!